Meditation word for this week is ‘Sky’. 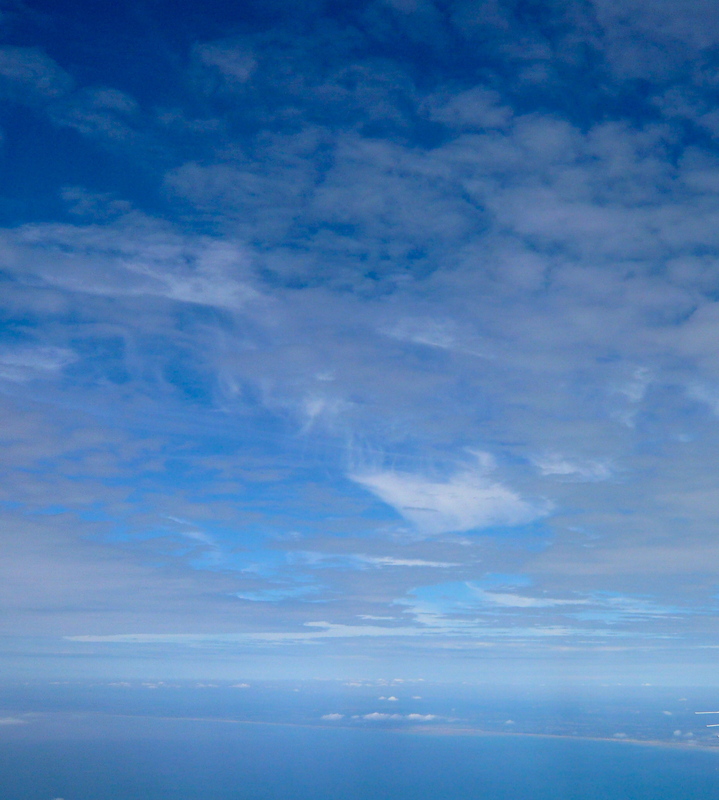 Sky is a challenging word: how can we keep our minds on something vast that is constantly changing? And if we do manage to hitch a ride on the lightwaves, how do we stay calm and centred? Looking at the sky with our mind’s eye is like looking at the skyscape of our own minds. Calm our thoughts, and the sky we conjure up in our mind becomes calm too… and yet always changing. Meditating on sky helps us to understand the constantly changing currents of humanity… and find our own still point within the constant change. Looking down at land from the sky, everything looks so ordered, and patterned, like a vast, intricate woven carpet. We know that the people way down below are a seething mass of emotions. We know we are too… and yet, from one mile high, it looks as though everything is just the way it is meant to be. And then we may discover something interesting: what if our own lives are like intricate, hand-woven carpets? From our usual vantage point, on the surface, it feels like we’re struggling, sometimes getting nowhere, sometimes meeting a dead end and having to retrace our steps. And yet… from the sky’s point of view, our lives look perfect, with colours, themes and motifs all placed exactly right. The U-turns we take and the mistakes we make may actually look like beautiful flowers from the air. The times we ambled along may look like silken mountain streams bringing much needed water to the flowers. And our most wonderful moments may look like bright woven diamonds, a stunning motif that recurs at exactly the right moments to help the pattern to look complete. For ideas on how to meditate, do take a look at our quick guide.